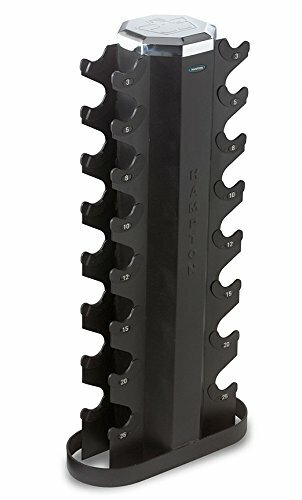 Hampton V-2-8 Two-Sided Vertical Dumbbell Rack - This incredibly sturdy vertical rack is perfect for holding Hampton Dura-Bell and Hampton Chrome Beauty-Grip Dumbbells, as well as other iron compact hex dumbbells, rubber hex dumbbells, and chrome dumbbells. The vertical stacking design is space-efficient, which means it's great for home use and use in small areas. The solid foundation keeps this rack stable at all times no matter what the dumbbell configuration. A special design means no pinched fingers when placing the dumbbells, and easy-to-read labels promote correct dumbbell placement. The protective vinyl cradle linings also assist in protecting the dumbbell handle finish from scratches and scuffs. With its chromed octagon cap and powder-coated black finish throughout, the Hampton V-2-8 is as stylish as it is functional and is well received by home gym enthusiasts and training studio owners alike. The Two-Sided Vertical Rack holds any 8 pairs of compact dumbbells sized 2.5 thru 25 pounds. Dumbbells NOT included. Two-sided vertical racking designed to hold 8 pairs of dumbbells up to 25 lb sizing. Cradle spacing designed for smaller chrome, iron hex, rubber hex, or urethane hex dumbbells. Cradles are numbered for easy dumbbell organization. Heavy nylon lined to protect dumbbell handles. Heavy 12-gauge steel construction. Space saving design for fitness studio, hotel gym, or home gym. Dimensions: 18" W x 8" D x 42" H. Weight: 45 lbs. Black finish with chrome octagon top cap.